This isn’t even a recipe card, it’s just cut out of a piece of card stock. Thrifty lady! 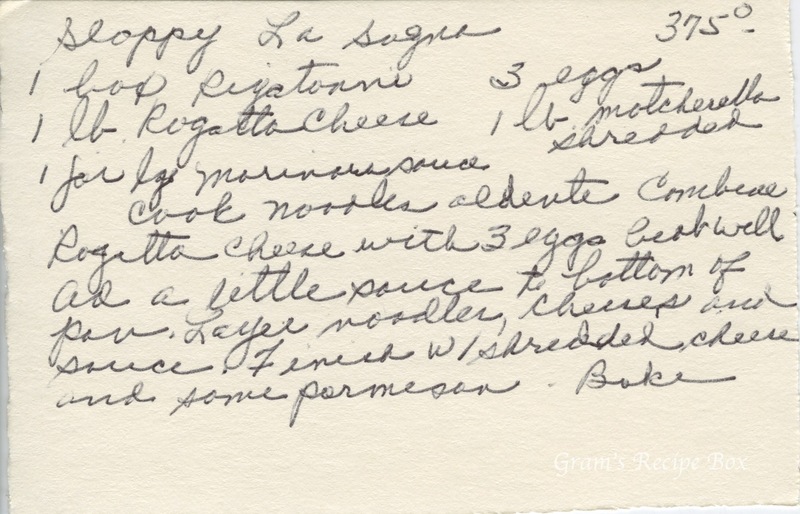 It’s one of my favorites though, because I love the phonetic spellings of the cheeses. This is more of what my mother would call a rigatoni bake. Cook noodles ardent, combine regatta cheese with 3 eggs, beat well. Add a little sauce to bottom of pan. Layer noodles, cheeses and sauce. Finish w/ shredded cheese and some parmesan. Bake.